Forced selling by leveraged investors flush with so-called shadow financing was responsible for accelerating China’s stock market crash three years ago, according to new academic research. In failing to restrain financial innovations that allowed leverage to explode, China repeated a phenomenon with precedents dating to the Wall Street crash of 1929, researchers including Kelly Shue from the Yale School of Management and Jiangze Bian of Beijing’s University of International Business and Economics, wrote in a paper. The researchers found “strong empirical evidence that leverage-induced fire sales, originating primarily in the fintech-fueled shadow sector,” contributed to the market crash, they wrote in a paper released by the National Bureau of Economic Research, a U.S. non-profit organization. “Unregulated shadow-financed margin accounts, facilitated by fintech lending platforms, contributed more to the crash despite their smaller asset holdings relative to regulated brokerage accounts,” the report said, citing account-level trading data tracking hundreds of thousands of margin investors’ borrowing and trading activities. China’s stock market is different now than it was in 2015, Fang Xinghai, vice chairman of China Securities Regulatory Commission, said at a Davos forum panel in Tianjin on Tuesday, a day after the country’s benchmark gauge fell to its lowest close since 2014. Fang said he doesn’t see risk of forced selling by individual investors because leveraged trading in minimal. Outstanding balances of loans used for margin trading in China peaked at more than 2.2 trillion yuan in June 2015, according to reported data from the China Securities Finance Corp. The report stopped short of attributing the initial trigger of the crash to investors making use of such financing channels, who were predominantly individuals outside of the professional finance industry. It added that the Chinese market’s valuations in mid-2015 made an eventual correction possible. 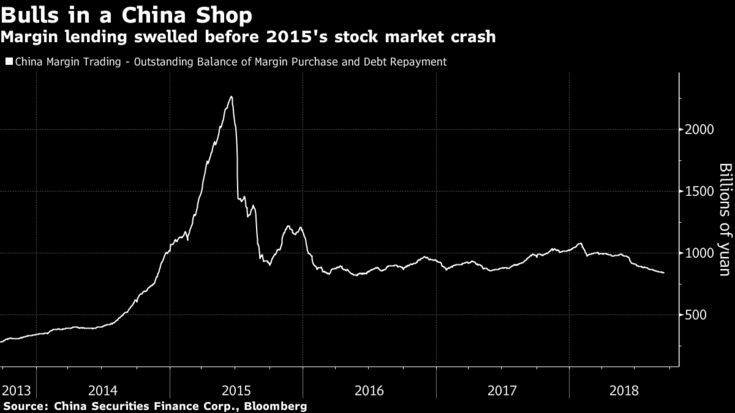 Accounts that made use of shadow financing circumvented the leverage limits set by the China Securities Regulatory Commission because limits were negotiated between borrowers and lenders, the report said. “Not surprisingly, shadow accounts have significantly higher leverage than their brokerage counterparts,” it said. 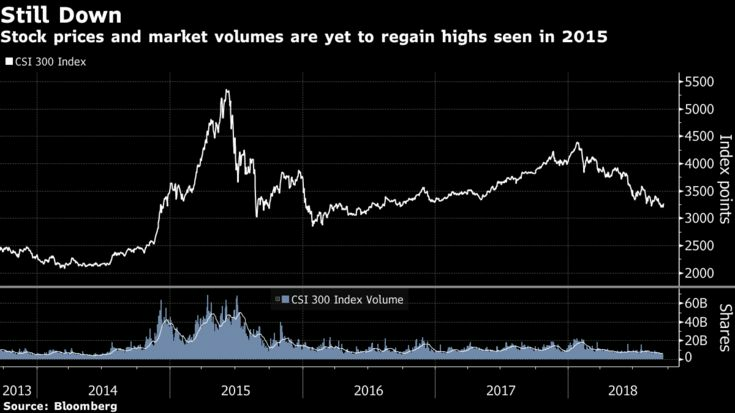 The report also found that the Chinese government’s efforts to stabilize the market by reining in leveraged trading may have proven counterproductive by speeding the rate of liquidations.